assist in the administration of the Tree Cost Share Program. Cost Share Program - The City will pay 50% of the cost of a tree planting up to $75 per tree, provided the tree is planted in the parkway or that area located between a property line and street curb. Arbor Day Program - Annually the Tree Board conducts a planting at local elementary schools to teach children about the benefits of trees, tree planting and tree care. in 2010, the Tree Board provided evergreen sapplings to over 120 4th Graders through the 4th Grade Forester Program. The sapplings were to be taken home and planted. The Tree Board plans on conducting the 4th Grade Forester program on an annual basis. Arbor Day Proclamation - In recognition of the Tree Board's efforts and the value trees add to a community, the Mayor reads and signs an annual Arbor Day Proclamation. The event is televised and appears in printed media to inform the citizens of the value of trees and Arbor Day related celebrations. 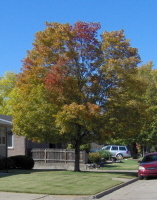 Tree Maintenance Ordinance - The City tree maintenance ordinance is part of the City Code and is enforced by the City Forester (Building Official) through the Community Development Department. The Tree Board meets on the 4th Tuesday of every other month at 5:30 pm in the Dwight D. Eisenhower building at 419 N. Broadway.